Many cultures around the world have used bird feathers as decorative accessories to denote status, wealth, and even royalty. Nowhere did this unusual art form reach greater popularity than in China, beginning a thousand years ago and continuing to this day. Using the kingfisher-with its uniquely iridescent range of ultramarine to bright turquoise-blue feathers-as their bird of choice, Chinese artisans created extraordinary objects, rendering the many-hued feathers with exquisite technique. The sheer breadth of these objects is staggering, from massive eight-foot-tall screens to tiny two-inch-long hair pins, from ornately ornamental lanterns to elegantly simple bird cages. Beverley Jackson has once again gathered an exceptional group of objects for study from great museums and private collections alike. 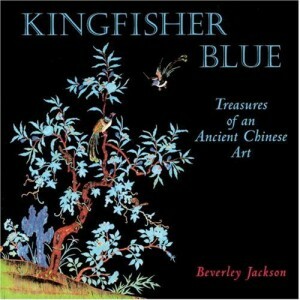 Her lively, informative text and unique selection of historical photographs make KINGFISHER BLUE a coffee table book that reads like a novel. The first book-length treatment on this subject. With 150 full-color photographs throughout.